Orange dinnerware is readily available these days and they make a kitchen or dining table look very cheerful. This trend of modern dinnerware is wonderful for creating a bright, care-free kitchen or dining room setting. If you get creative, the concept of orange dishes will bring up some pretty original ideas. Can you imagine having a costume dinner party? Orange and black dinnerware is perfect for creating a fun-filled atmosphere for Halloween parties. Spooky music, Halloween decorations, and recipes that are fitting to the theme can make for a memorable evening. Want to bring in the fall with class? 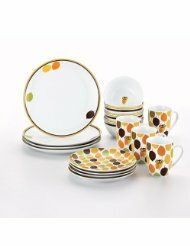 Pattern dinnerware set with fall colors, such as orange, yellow, green, red, and brown are definitely fit for the autumn season. They awesome for both decorating and serving. 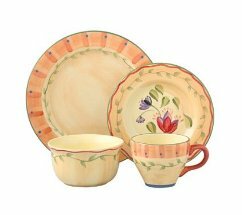 Why not set the mood for spring and summer with floral dinnerware? A lot of floral dinnerware has a hint of orange in them and they make beautiful dishes as well as a relaxing, but joyful kitchen. When it comes to decorating with orange, the possibilities are endless. 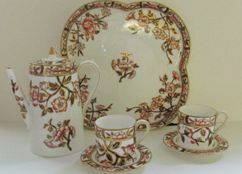 Orange dinnerware comes in solid-colored dinnerware, two-tone dinnerware, and wonderful, frivolous pattern dinnerware. 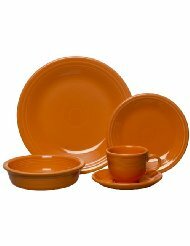 If you are looking for solid-colored dinnerware, Homer Laughlin currently produces Fiesta dinnerware in Tangerine, which is orange. This is a wonderful choice because Fiesta comes in so many colors, that you can mix and match with it as time goes on for new and exciting ideas. 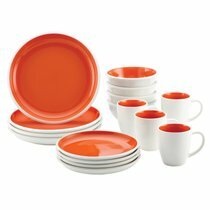 Two-tone dinnerware in orange and white is offered in the Rachael Ray dinnerware line. The Round and Square pattern is basically orange with white on the bottoms and inside the dishes, while the Rise collection features plates that are orange on top and white on the bottom, with bowls and mugs that are white on the outside and orange on the inside. I really like the style of these dishes. Pattern dinnerware with orange in them include the Paisley and Little Hoot patterns by Rachael Ray, Trellis Round by American Atelier, and the Napoli dinnerware pattern by Pfaltzgraff, just to name a few. While of the dinnerware with orange in it that I have seen is modern dinnerware, it is possible to find some patterns with orange in vintage or antique dinnerware. These dishes can be used for decorating or serving, or both. They make a happy-go-lucky style with colorful dinnerware that brightens up any atmosphere.